(Nanowerk News) University of Utah engineers have developed a polarizing filter that allows in more light, leading the way for mobile device displays that last much longer on a single battery charge and cameras that can shoot in dim light. Polarizers are indispensable in digital photography and LCD displays, but they block enormous amounts of light, wasting energy and making it more difficult to photograph in low light. The Utah electrical and computer engineering researchers created the filter by etching a silicon wafer with nanoscale pillars and holes using a focused gallium-ion beam. This new concept in light filtering can perform the same function as a standard polarizer but allows up to nearly 30 percent more light to pass through, says U electrical and computer engineering associate professor Rajesh Menon. The study is being published in November's issue of Optica ("Ultra-high-efficiency metamaterial polarizer"), a new journal from The Optical Society. 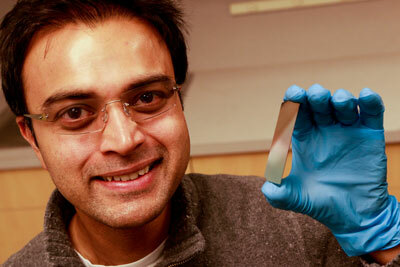 University of Utah electrical and computer engineering associate professor, Rajesh Menon, holds up a piece of silicon that has been etched with microscopic pillars and holes to create a polarized filter. He leads a team of researchers that have developed a new polarizer that can allow more light to pass through than conventional polarizers. This could lead to LCD displays for smartphones and tablets that last longer on a battery charge and cameras that can take better pictures at low light. Sunlight as well as most ambient light emits half of its energy as light polarized along a horizontal axis and the other half along a vertical axis. A polarizer typically allows only half of the light to pass because it's permitting either the horizontal or vertical energy to go through, but not both. Meanwhile, the other half is reflected back or absorbed, but the resulting image is much darker. Polarizers are widely used by photographers, for example, to reduce glare in the image. They also are used in LCD displays to regulate what light passes through to create images on the screen. "When you take a picture and put the polarized filter on, you are trying to get rid of glare," Menon says. "But most polarizers will eliminate anywhere from to 60 to 70 percent of the light. You can see it with your eyes." Yet with Menon's new polarizer, much of the light that normally is reflected back is instead converted to the desired polarized state, he says. The U researchers have been able to pass through about 74 percent of the light, though their goal is to eventually allow all of the light to pass through. LCD displays on devices such as smartphones and tablets have two polarizers that ultimately throw away most of the light when working with the liquid crystal display. "If one can increase that energy efficiency, that is a huge increase on the battery life of your display. Or you can make your display brighter," Menon says. Menon's team validated their concept using a polarizer that is only 20 by 20 micrometers and tested with only infrared light. But they plan to increase the size of the filter, use it with visible light, and figure out a way to make it more cost effective to manufacture. Menon says the first marketable applications of this technology could be available in five to 10 years. The technology also could be a boon for photographers who want to bring out more detail in their pictures while shooting in low-light situations and for scientists using microscopes and telescopes to visualize obscure phenomenon.